Oh Austin, how I’ve missed you! 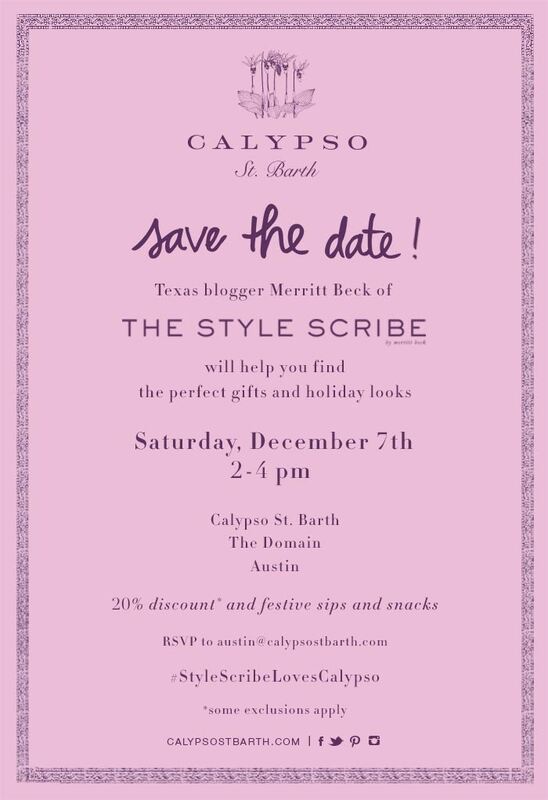 I’m thrilled to announce that I’ll be hosting a holiday party with Calpyso St. Barth at The Domain in Austin on Saturday, December 7th! Swing by from 2-4pm to shop holiday gift ideas hand-selected by yours truly, enjoy a 20% discount and enter our Instagram contest to win a great gift from Calypso. It’s going to be a blast – CLICK HERE to RSVP now! Be sure to follow me on Instagram as I post sneak peeks about the event as we close in on the party! Speaking of the holidays, I’m over on Sea Island Drive today styling a Christmas Dinner Tablescape for your inspiration – click here to check out the feature, and thanks Rebecca and Paula for featuring me! Thank you Merritt for being on Sea Island Drive! Hope to have you back soon!